The Bhutanese people protected this sacred heritage and unique identity for centuries by choosing to remain shrouded in a jealously guarded isolation. The Kingdom is peopled sparsely, with a population of only 678,000. Four main linguistic groups constitute Bhutan's population: the Sharchopas, who are held to be indigenous inhabitants, the Bumthangpas and the Ngalongpas who originate in neighboring Tibet, and the Lhotshampas, recent immigrants of Nepalese origin. The inhabitants of Bhutan are gracious, gentle and very hospitable. They are peace loving and possess a lively sense of humor. The gateway to the south, it is a thriving commercial center on the northern edge of the Indian plains. Situated directly at the base of the Himalayan foothills, Phuentsholing is a fascinating mixture of Indian and Bhutanese, Phuentsholing a perfect example of the mingling of peoples and cultures. Being a frontier town, Phuentsholing is a convenient entry/exit point for visiting Bhutan and also the neighboring Indian states of West Bengal, Sikkim and Assam. This beautiful valley encapsulates a rich culture, scenic beauty and hundreds of myths and legends. 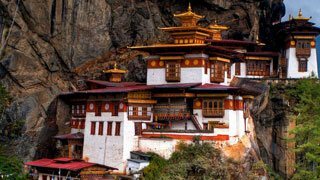 It is home to many of Bhutan's oldest temples and monasteries, the country's only airport, and the National Museum. Mt. ParoChomolhari (7,300m) reigns in white glory at the northern end of the valley, its glacial waters plunging through deep gorges to form the Pa Chu (Paro River). The Paro valley is one of the Kingdom's most fertile, producing the bulk of Bhutan's famous red rice from its terraced fields. The capital town of Bhutan, and the center of government, religion and Thimphucommerce, Thimphu is a lively place, an interesting combination of tradition and modernity. Home to civil servants, expatriates and the monk body, Thimphu maintains a strong national character in its architectural style. Located south of Punakha and the last town before central Bhutan, Wangduephodrang is like an extended village with a few well-provisioned shops. The higher reaches of the Wangduephodrang valley provide rich pastureland for cattle. This district is famous for its fine bamboo work, stone carvings, and slate which is mined up a valley a few km. from the town. This town, perched on steep slopes above a river gorge, forms the central hub of the nation and is the place from where attempts at unifying the country were launched in former times. The landscape around Tongsa is spectacular and its impressive dzong, stretched along a ridge above a ravine, first comes into view about an hour before the winding, mountain road leads you into the town itself. This lovely valley is the religious heartland of the nation and home to some of its oldest Buddhist temples and monasteries. Tales of Guru Padmasambhava and the tertons ('religious treasure-discoverers') still linger in this sacred region. The journey from Bumthang to Mongar, crossing over the 4,000m high Thrumsing-la pass, is scenically spectacular. Mongar marks the beginning of eastern Bhutan. The second largest town in the subtropical east, Mongar is built high on a gently sloping hillside. Tashigang lies in the far east of Bhutan, and is the country;s largest district. Tashigang town, on the hillside above the Gamri Chu (river), was once the center for a busy trade with Tibet. Today it is the junction of the east-west highway, with road connections to Samdrup Jongkhar and then into the Indian state of Assam. This town is also the principle market place for the semi-nomadic people of Merak and Sakteng, whose way of dress is unique in Bhutan. 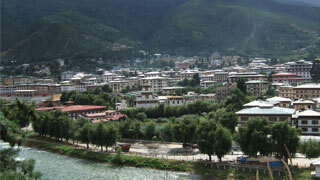 Tashiyangtse is a rapidly growing town and administrative center for this district. Situated in a small river valley, it is a lovely spot from which to take walks in the surrounding countryside. The dzong overlooking the town was built in the late 1990s when the new district was created. Tashiyangtse is famous for its wooden containers and bowls, which make inexpensive, attractive and useful mementos of a visit to this remote region. The Institute for Zorig Chusum, where students study the 13 traditional arts and crafts of Bhutan, is also worth a visit.